LOUIE is one of 3 brother pups turned into a Kentucky shelter when their owner decided to move. He is a bit more submissive than his brother BOBO, but is also gentle and submissive around other dogs. He is a year old and would do best with dogs and kids that are low key. LOUIE will need reassurance so he knows he is a 4-legged family member who is not going to be abandoned again. 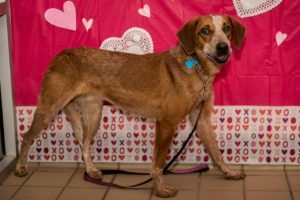 This entry was posted in 6 to 12 Months, Adopted, Adopted Dogs, Dog Center, Dogs, Male, News. Bookmark the permalink.